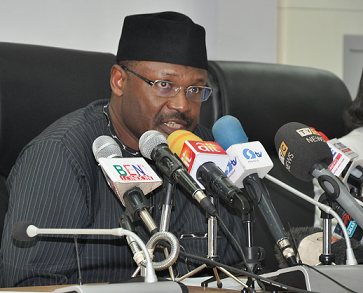 The Independent National Electoral Commission (INEC) on Wednesday said that the commission was targeting registration of 80 million Nigerians in the Continuous Voter Registration (CVR) ahead of the 2019. The Chairman of the INEC, Prof Mahmood Yakubu, said this at a dialogue with a coalition of Civil Society Organisations in Abuja . Yakubu, who was represented by Prof Okey Ibeanu, an INEC National Commissioner, said that so far, the commission had added other four million registrants to the voters’ register so there were around 72, 73 million registrants. He said that if the rate of registration being experienced was anything to go by, the number would approach 80 million by the time the process was concluded. He said that the commission expended between N115 billion and N120 billion on the 2015 polls. “Elections are not really coming cheap in Nigeria so to speak; the 2015 election cost the country between 115 and 120 billion naira. “Compared to that of 2015, the 2019 election budget would be affected by the current exchange rate of naira to dollars. “Now you can do a computation, 150 naira to the dollar in 2015 and 300 to the dollar right now. You can then imagine what the present election might cost,” he said. Yakubu explained that the electoral umpire had done everything possible to keep the budget for the 2019 election consistent with the exiting realities of the country. “Again, this goes back to the question of concluding on the electoral legal framework because if you are going to do transmission by law from the polling units that means additional cost. “If you are going to have an additional round of election, that will mean additional cost. The INEC chairman said that the Electoral Act provided that 60 days into a new year or not later than 60 days into a new year, the commission should avail political parties the list of registered voters from the previous year. He said that the commission had already complied with that, adding that political parties received the registered voters from 2017 about two or three weeks ago. Yakubu sought partnership with the civil society organisations (CSOs) and other stakeholders on how to deal with high cost of conducting election in the country. He expressed the hope that in the long term, partnership was one major area that INEC, Situation Room and other stakeholders would engage to see how to deal with the question of cost of election. He said that there were already discussions going on collaboration but needed to be taken more seriously. He added that the budget for the election had been completed and submitted to government and the commission was still awaiting reaction. According to NAN, the Convener of the Nigeria Civil Society Situation Room, Mr Clement Nkanwko, said the essence of the meeting was to engage INEC on how far it had fared. Nwankwo said that there was need for Nigerians to know the improvement made on the ongoing continuous voters registration. He said this would enable the commission to know how it could improve on the process towards making 2019 poll a success.